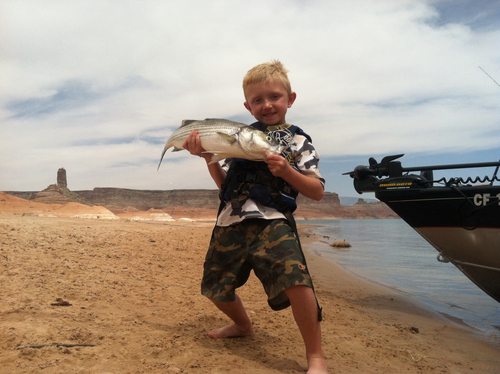 Lake Powell Fishing ReportJuly 23, 2014Lake Elevation: 3608Water Temperature 77-85 FBy: Wayne Gustaveson of Wayne&apos;s WordsSTRIPERS BOILING! Big news began pouring in on July 25th. Stripers were boiling in the northern Lake from Good Hope Bay to White Canyon. As the week progressed more reports followed. Stripers were seen feeding on the surface all day long from Good Hope Bay upstream. Even better news confirms that these are "boils" and not "slurps". The difference is that slurping fish require an accurate cast and great retrieve before a fish can be caught. On the other hand boiling fish will hit any respectable lure that lands in the circle of fish. Catching is assured when in the feeding zone. Water color is now clear enough for striped bass to see their shad forage. When water was murky due to runoff shad were protected for at time as sight feeding stripers were unable to consistently find shad. Now that is past. The buffet is open and stripers will eat shad early and often as long as the supply lasts. Anglers are now needed to go save some shad! The most effective baits are top water lures and shallow running crankbaits. These result in a hook up every cast. The downside is that treble hooks and energetic stripers require more time to unhook before the next cast can be thrown while the boil is still in casting range. A helpful hint to speed up the process requires a "fishing towel". When the hooked striper hits the deck throw a hand towel over the fishes&apos; back and quickly pick up the fish. The towel is thick enough to protect your hand from dorsal spines. With the fish supported in this manner the weight is off the hook and it makes it easier to unhook the fish using a handy pair of pliers. The second option is to use a single hook on a jig or spoon. This type hook can be removed more quickly than a treble which allows the next cast to be made more quickly. The downside to this method is that the hookup occurs underwater where it can be felt but not seen. It is so exciting to see a school of stripers play "volleyball" with your lure. A surface lure can be batted back and forth many times before one fish finally gets the hook in its mouth. That is quite exciting even when the fish misses the lure. My "go to" method for boils is to remove the belly hook from a big Jumpin&apos; Minnow surface lure. When the fish hits the deck (No Net Used) I grab the big lure and use it as a handle since there is no hook on the lure body. The only hook is in the fish&apos;s mouth. I first shake the lure hoping the fish will come unhooked with a quick jerk. When that happens I can throw the next cast within seconds. After the boil moves out of range the deck is cleared and all deck fish are then put on ice before moving to the next skirmish line. In the heat of summer it is critical to have a fish cooler with ice. These fish will retain their great eating quality when put directly on ice. Never put fish on a stringer or in a live well with 85 degree water. That warm water quickly degrades eating quality. It is wise to enjoy the catching and retain eating quality by being prepared with the right fishing equipment and a cooler full of ice. Boil fishing does not require the same light fluorocarbon line that has to be used when bait fishing. Braided line can be tied directly to the lure. I still use fluorocarbon leader on my fishing rig but I go to 12-pound test so fish can be flipped into the boat without using a net. It is infuriating to have the second treble hook imbedded in the net when the fish are boiling right next to the boat. I would rather lose the first fish and then cast to the second one than spend my time impatiently unhooking lures from a badly tangled old fashion net. If a net is used make sure it has rubber mesh. Sorry – I get a bit invigorated when thinking about fishing striper boils. It is the ultimate freshwater fishing sport! Photo: Jaxson Jones, Phoenix AZ, helped his dad manhandle this big striper caught trolling in Padre Bay. Stripers are boiling in the northern lake but trolling 20-25 feet deep works better on the south end.